[prMac.com] Frankfurt am Main, Germany - Berbie Software today is pleased to announce the immediate release of BigHairyGoal for Mac OS X. BigHairyGoal is a tool for creatives and software developers for getting ideas and concepts down and to arrange them in a way that gives more insight. BigHairyGoal supports creatives with the process of visualizing alternative approaches and to reason possible decisions when facts, sources and ideas are collected. Users of BigHairyGoal can easily cluster out details while keeping the big picture visible as an information radar of progress and success. BigHairyGoal functions like a whiteboard letting users attach note cards to, connecting them with lines and to reorder them. BigHairyGoal automatically moves cards aside when overlapping. BigHairyGoal supports three different types of cards: text, image and url. Resources from any location like Finder, Safari and the iCloud photo stream can be dragged or screenshots can be pasted into the workspace. BigHairyGoal is similar to mindmapping tools but is non linear, therefore BigHairyGoal is a more flexible brainstorming tool to create moodboards, inspiration boards or lighboxes. BigHaryGoal can act as a progress tracking board by featuring methods from the well known getting things done approach for todo task (also known as GTD). To design an approach and to track the progress, cards have management attributes like status, size, importance, dependencies, relations and grouping. To keep users focused, all attributes are visualized in clear colors, without distracting visual styles. BigHairyGoal 1.1 is $13.99 USD (or equivalent amount in other currencies) and available worldwide through the Mac App Store in the Business category. Started in 2005, Berbie Software pioneered the development of a Mac OS X applications focused on route planning and visualization of workout data and training progress for long distance sports. All software solutions created by Berbie Software follow the simple idea of "just go, inspect and adapt". 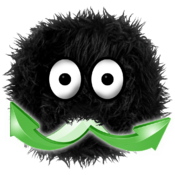 BigHairyGoal is a logical extension to the product portfolio for the creative and software development businesses. Copyright (C) 2005-2013 Berbie Software. All Rights Reserved. Apple, the Apple logo, Macintosh and Mac OS X are registered trademarks of Apple Inc. in the U.S. and/or other countries.